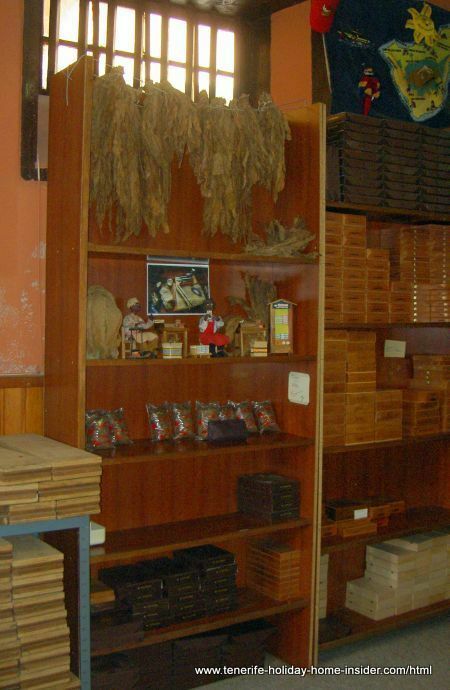 Tenerife cigars are much wanted as gifts or by people that simply love smoking them. The shop Tabacos Arturo sells them. Some insist on Cuban ones but, Tenerife offers a good alternative. Besides, best cigars which always come from Cuba are much more expensive than the so called Puros Tinerfeños or Puros Canarios, as the locals say in Spanish. Hand made or hecho a mano applies to Arturo's house brand. My pal Guenther Dahmen recommended Tobacco Arturo to me. He's known it since 1972. The other day, I managed to visit this shop again which is now in a new location. It's in Avda. Tomé Cano, 8 right opposite the famous, natural pools Caletón or Charcos of Garachico. In fact, it's next door to the good seafood restaurant Restaurante Rocamar There too, stone steps lead to a high first floor entrance. Arturo' s business is marked with a prominent plaque. 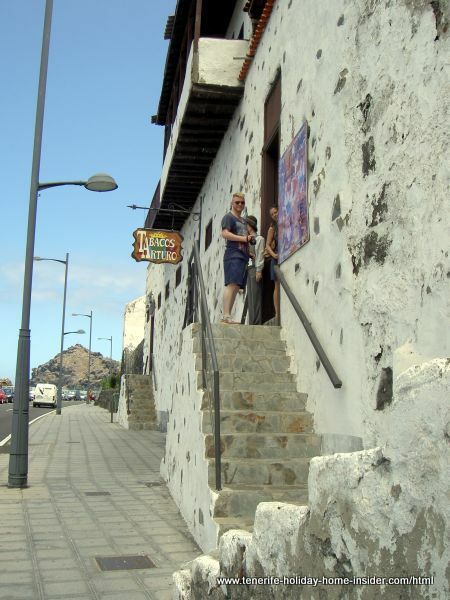 A life size Tenerife custom dressed Mannequin stands in local custom attire outside his door. But don't look too critically at the way those cigars are made. I admit it looks rustic. 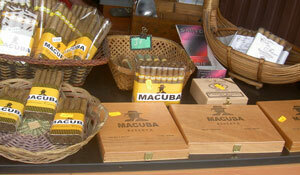 The shop Tabacos Arturo seems to promote mainly the Macuba brand. However, there were more boxes on top of shelves in the back. We were in a hurry on our day trip to Icod, Masca, San Eugenio beach and Arona. I tried to find out only the most important. Yes, the man whose name might be Miguel Angel Jiménez Muñoz because that's what his business card says can sell you hand rolled cigars. They are much in demand. The salesman made one for me. I suppose that he can make any shape or virtually any size if the tabaco leaf he pulls out permits. Therefor, no point to show you a photo. For a rather slim pointy cigar he charged me 1 Euro a price that may have gone up over the years. 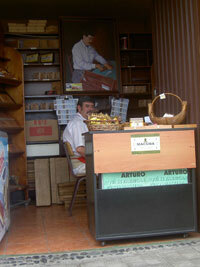 My pal just loves hand rolled Tenerife cigars from Tobaccos Arturo and says that's the best shop for it on the island. I haven't tried the one I bought. A victim needs finding to sample mine. This cigar is called a Caliceño. To judge by the smell of the tobacco it must be good. Bad quality cigars bought in Tenerife? 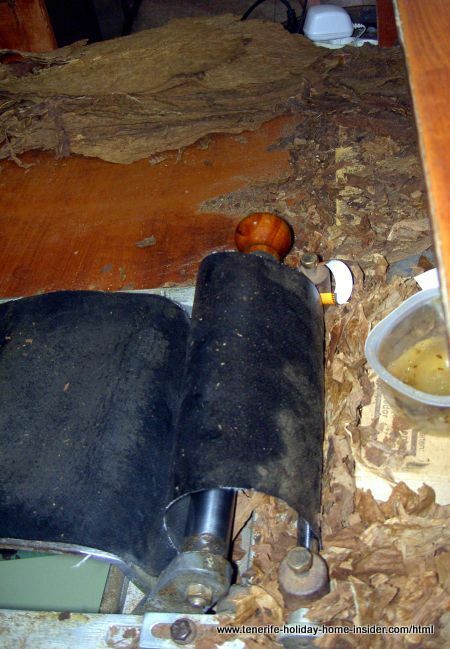 Be careful when you buy hand made cigars on the biggest Canary Island or anywhere on its archipelago. 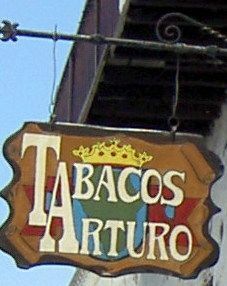 Mind that Tabacos Arturo is a brand name. It's very unlikely that his merchandise isn't fresh and in top condition when you purchase it. On the other hand, it may be possible that even those cigars have a limited life like all produce. The exception would be such ware that contains heavy preservatives or much salt. Both ingredients are very unlikely with Arturo's merchandise. So don't just buy "perishables" like cigars on a flea market. Cigars made in Cuba and Garachico and what about Germany? Would you believe that there was once a real Tobaco culture in the town of grand parents of mine in Germany near Heidelberg? Now there is a cigar and Tobaco museum in Lorsch Hessen Unfortunately, the information is only available in German. I remember the fields of the aromatic leaves for smoking from my childhood days. But grand dad would only puff them "made in Cuba". The museum comes as as surprise to me. From Tenerife cigars to shopping in Tenerife. Back to Top of Page?